The HRP-3 Promet Mk-II robot is not one of those shiny, intellectual robots that are fluent in over six million forms of communication. The HRP-3 Promet is designed to withstand heavy rains, carry out disaster relief operations and even work in places that are too dangerous for human beings. The HRP-3 Promet Mk-II is shown above brandishing an electric screwdriver, looking for loose screws. Five feet, three inches tall, weighing 150 pounds, the robot has improved balance and coordination as well as tougher hardware than earlier versions. "We have made a leap towards creating a humanoid that works in a real environment," said a spokesman for Kawasaki Heavy Industries and the National Institute of Advanced Industrial Science and Technology. "Our country [Japan] is rapidly aging and it is an urgent task to develop robots that can perform tasks only done by humans now." Mecha creator Yutaka Izubuchi, known for work on such anime as Gundam and Patlabor, is the designer of HRP-3 Promet Mk-II. 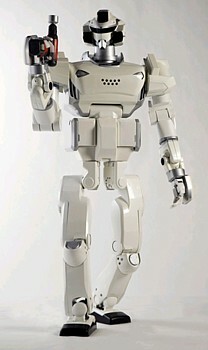 This robot reminded me of a fictional bot created by writer Harry Harrison. In his 1956 story The Velvet Glove, autonomous robots are expected to seek work on their own; a robot that needs to work to earn money for parts and service can't be too picky about the work that is offered. Take a look at this HRP-3 Promet MK-II video, set to Senor Coconut's cha-cha version of Kraftwerk's 1978 classic The Robots. Who knew that in the future, robots would walk like Steve Urkel.